Book by Haider Warraich, M.D. Do you know how your parents or your spouse want to die? My mother knows exactly what to do with my dad’s company if something happens to him, but she doesn’t really know what to do with him. Family dinners are great for discussing financial crises, philosophy, travel, relationships, life. But growing up in Greece, I don’t remember a single family discussion that involved death. We are afraid to even mention the word because of its grim, inescapable implications. We feel that it doesn’t concern us, at least not for now. We feel that it might bring bad luck. But unpleasant as it may be to discuss, it’s a relief to know how your loved ones want to spend their last days so that you don’t have the burden of making the decision. Should you keep them on a ventilator for what could be years or gently let them go? In his new book Modern Death: How Medicine Changed the End of Life, Haider Warraich, a young cardiologist at Duke University, helps us understand how one of the most fundamental and significant events in our lives—indeed, the final one— has dramatically changed because of technological advancements. 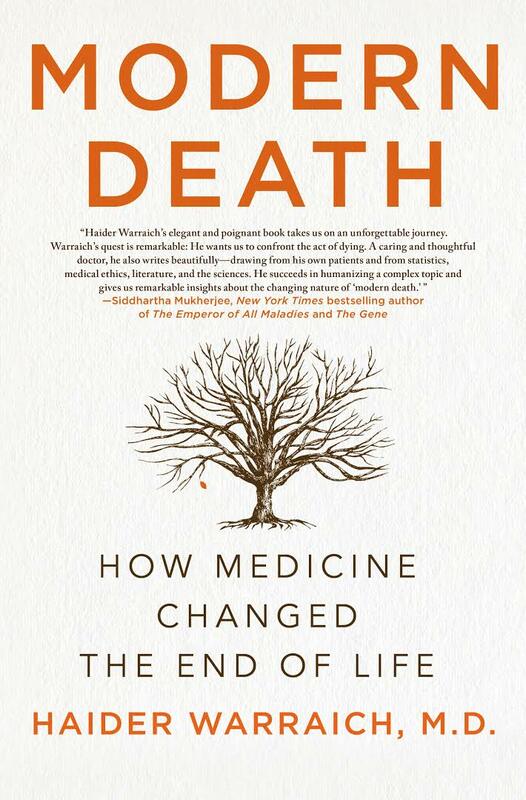 He argues that modern medicine has created a “dying” phase in many people’s lives, when they are neither alive nor dead. They might have a beating heart but no ability to communicate with their environment; they might have a terminal disease accompanied by excruciating pain, but are still alive. All these “in between” conditions are new to humanity and raise significant issues worthy of discussion. Warraich tackles the ethical and social implications of these changes, and how they challenge both a dying individual and the family members who attend this final passage. I think this dilemma is intrinsically connected with the definition each of us gives to death, which significantly varies depending on our cultural background and personal experiences. How do you know that your loved one is actually gone? In many spiritual cultures, like Islam, people believe in the existence of a soul and that a person is really gone not when vital signs disappear, but when the soul leaves the material body. For a Muslim, it is hard to conclude that a loved one is dead if their heart is still beating, despite the fact that the patient is pronounced brain dead. Since a part of the body is still functional, even with mechanical support, the soul might still be there. Therefore, the definition of death becomes more complex if we consider cultures other than Western civilization. If your heart is still beating but there is no way you can communicate with your environment, are you alive or dead? These are the kinds of questions that most of us avoid, but all of us need to face. Warraich introduces us to his world, where he is constantly exposed to incidents that fire these questions. On one occasion, he was treating David, a chronic heroin user who went into cardiac arrest. David ended up in a vegetative state, displaying only basic reflexes and lack of any higher brain function. The doctors “wrote in their notes that the likelihood of a poor outcome was 100%.” David remained comatose for months, then he suddenly woke up. “Hello Doctor,” he said. This story clearly indicates the difficulty of diagnosing death, of telling when a person is alive and when one is dead. Modern Death is a great addition to the discussion of death, in the tradition of Sherwin Nuland’s ground-breaking How We Die. More important, however, it makes a place for death at our dinner tables. It makes us realize how important it is to talk about death at times when we are happy and relaxed rather than when we are in a crisis. I didn’t know until recently that my partner does not consider someone in a vegetative state to be alive. I didn’t know that he wouldn’t like to be kept on mechanical support if he couldn’t hear, feel or communicate with the people he cares about. I learned this while eating a spicy ragu in Brooklyn and drinking my favorite Australian pinot noir. Anastasia-Maria T. Zavitsanou is a first year Ph.D. student at the NYU School of Medicine studying how the immune system fights cancer. She believes that thinking about death helps people live more meaningful lives.